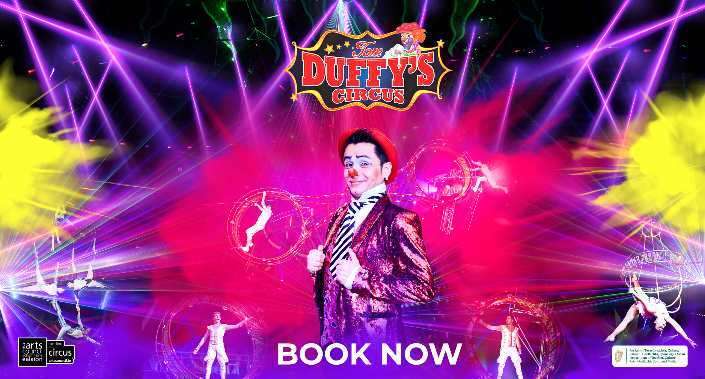 Welcome to Tom Duffy's, Ireland's Favourite Circus. Ireland's No. 1 Circus is back for 2019. An impressive line-up in promised from Ireland's Favourite Circus including acts from all corners of the globe and headlined by the Duffy’s own award winning Wheel of Death. Tom and Jamie Duffy are quite literally a whirlwind duo. Complete concentration, balance, absolute trust in each other and a fearless mentality combine together to produce a heart-stopping performance on the Wheel of Death. As the huge wheel revolves getting faster and faster the brothers run, jump and skip as the lights blur. There are screams and many members of the audience can only watch through their fingers. Jamie is one of only a handful of people in the world to perform a forward somersault on the outside of the wheel. In 2018 Tom & Jamie won the Silver Clown award at the Monte Carlo Circus Festival, the New Generation, in the Circus world this is equal only to the Oscars. These Irish boys are now a class act in their own right. Lovers of traditional circus acts will roar with laughter at the antics of the hilarious clowns, David and Raffy who take each other, the audience and cause general havoc throughout The Big Top. As always, the animal acts are the main draw for regular visitors. Our loveable giants, the St Bernard dogs, tend to dominate the ring, but it’s the cheeky miniature poodles that raise a smile with their mischief. With the modern Circus art of manipulating laser lights, Laserman combines a combination of lights and music resulting in a dazzling eruption of colour and wonder that will leave you breathless. The flying Zuniga really are Masters of the Air. Taking the traditional Flying Trapeze to new heights performing single, double and even triple somersaults high in the roof of The Big Top, culminating with a double passage with two fliers flying through the air at the same time, absolutely breath-taking. The Globe of Death is one of the most dangerous acts in modern Circus. Team Lucius take danger to the max with up to 5 stunt riders looping horizontally and vertically inside the mesh sphere Globe. These daredevils take danger to the MAX! Tom Duffy's 2019 is a show not to be missed! !